Thanks for the updates Kris! Btw, on the downloads page the description of the download is still the old version. I just tried to import xSNMP.Cisco.xml but it requires xSNMP 1.1.0.10 however xSNMP.xml is version 1.1.0.19. I was able to import xSNMP.Cisco.xml with xSNMP.mp. I would like to stick entirely to xml if possible. Any suggestions? Thanks for your comment. Unfortunately, this is not a viable option. In order to maintain the dependent relationships between the management packs, the xSNMP MP must be imported as a sealed (.mp) management pack. Importing the depedent management packs (other than the xSNMP Overrides MP) in their raw .xml source form will also create problems when future updates are provided. In order to store overrides for an MP in another MP, the targeted MP must be sealed. If you used the unseaeld management packs and created overrides, these would be lost the next time you imported an updated version. The .xml versions of the MP’s are provided purely as source code, and not intended to be imported in that form. Thanks for all of your hard work on this. Request: Support for Fortinet firewalls (FortiGate) via SNMP. Yes, please support Fortinet firewalls too! Thank you Kris for a superb MP! I have 160 snmp devices in SCOM covered by this MP…so I can confirm the MP’s rock!! You need to get a “Donate” button organised. Excellent MP, great work !!! 1. For CISCO. Device – switch 3560G. The device was right discovered (device itself, network interfaces,…). The problem is some network interfaces that really have “Physical Connection Present” not have this flag in their properties in SCOM. Because of that SCOM alerted on network interfaces that had down (InterfaceDown – State) and I can’t create dynamic rule for exclude these network interfaces. These management packs are amazing, thanks for all the time you’ve spent on them. I’m interested in writing/acquiring one for Sonicwall devices, specifically to monitor VPN activity. where 2051734120 is a connection ID and the only real reference to each VPN, and changes on each reconnection of the tunnel. Is this something that is possible to gather together using your class? Do you intend making a small tutorial using your class or even better building a sonicwall MP? Great work! xSNMP Suite Rulezzz! Wish that will be added support for QLOGIC FC-switches in next release. Chris and Raphael, this is some very, VERY good stuff! One issue I have noticed is a tremendous performance impact on the mangement server I am using as a proxy agent for SNMP devices since importing these MPs. Could this be alleviated by updating Powershell on that management server to version 2.0? I completely agree with AengusM, you need to add a DONATE button somewhere on here as soon as possible! Any chance I can contribute by working on an MP for Riverbed devices? Thank you for your comment. Regarding the performance impact, can you elaborate on how many devices/interfaces you are monitoring? As far as I know, I don’t believe that PowerShell v2 is supported with OpsMgr (have you seen otherwise)? I’m not familiar with Riverbed devices, but one of these days, I am going to put together a Management Pack development kit for the xSNMP MP’s that documents creating MP’s with the provided data sources and classes. Once I finish the Oracle MP that I am working on, I hope to make some progress in that area. If you wanted to get started, you could probably start by dissecting the provided MP’s and I can fill in any gaps by answering any questions you may have. Currently there are roughly 150 managed devices, and of the 1700+ interfaces discovered, only 100 are monitored (status only). Well, it did finally detect it, one issue, however. I get a lot of errors on things like the checkdevicestatus, etc. Always with a status of 0x6c. Thanks for reporting this issue. The 0x6c error is a timeout error. Are all of the errors related to one SNMP device or do they affect multiple SNMP devices? Interestingly enough the APC pack identifies my UPS and it identifies my smaller environmental monitoring device. But it doesn’t identify the other device. I have the base OIDs. Let me know if you need any mibs, but i am not sure why it doesnt like it. The one that does not work doesnt even’t even show up anywhere in the xSNMP sections. I’ve added two Checkpoint Nokia IP560 devices to SCOM. They’re not appearing under Check Point SPlat Devices, but they do appear under the stock Network Devices. Are these supported with the xSNMP management pack? At this point, the CheckPoint SPlat MP only supports Secure Platform devices, not the CheckPoint Nokia systems. I hope to work Nokia device support in soon. APC management pack has an System OID subtree missing – .1.3.6.1.4.1.318.1.3.22. * – it’s symmetraPX UPS devices – we have 2 of them. My powernet mib also contains .1.3.6.1.4.1.318.1.3.27 as smartUPS2, we don’t have such devices, but i suppose they may exist. And another question – are next releases of xSNMP management packs expected to be “compatible” in terms of SCOM? I’m going to deploy these management pack in production environment, where we have a lot of overrides and groups membership for discovered objects, and ability to upgrade is very important for me. Yes, I am getting timeouts but ONLY from this device. Also the probes are not all detected properly. Is there anything I can capture and email to you so you can understand? I have 3 APC devices, a 2 port env monitor (works great), a 10k UPS (also works great), and a AP3940 which is expandable. This last one gives me grief because the probes are based on the unit they are connected to. I have 12 probes connected to a device and a slaved unit. Also with the Brocade one, I would like to be able to gather performance statistics and error statistics for reporting in SCOM. Wow…impressive work! I am just headed into the network device monitoring options for SCOM. I have looked at Solarwinds and Whatsup gold, and while they look nice, I hate to use 2 different consoles to monitor my network. How long do you plan to support this xSNMP package? I find out that xSNMP Cisco MP didn’t discover a number of interfaces of “Tunnel” type. What’s wrong? IS there any way to use xSNMP and the new feature in LiveMaps to automate network diagrams? I haven’t tried it out actually. If you get a chance to test LiveMaps with xSNMP, I’d be glad to hear about it. Thanks for your comment. We’ve been using your Cisco MP for a while in LiveMaps and it works great! 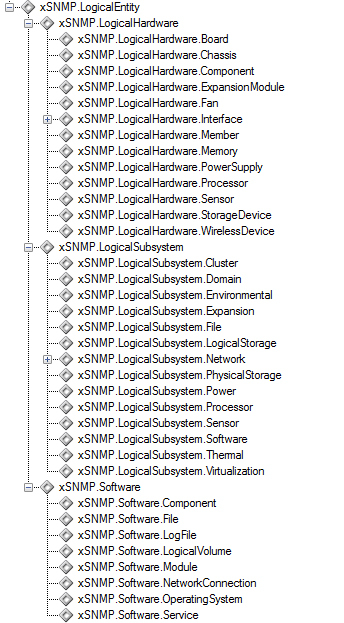 The xSNMP works great too, however it doesn’t have the Automatic Network Topology Mapping…which would be brilliant. The demo on SAVision’s website shows how JalaSoft’s Xian Network populates Ops Manager with information about the connections between devices, i.e. router X has switch Y plugged into interface 3 and switch Y has server Z plugged into interface 9. This makes topology diagrams a breeze! Anyways would like to say thanks for the MP’s and for showing us how to write management packs! Currently only the Jalasoft Xian MP supports discovering links between computers and network device ports. See the video from Savision for this. The automatic network discovery button in LiveMaps stays greyed-out when using xSNMP and computer objects in a drawing. So I don’t think it’s going to work with the current xSNMP suite. “Jalasoft is currently the only MP provider that discovers network topology and stores it in OpsMgr. Microsoft is planning to add this functionality in OpsMgr vNext. nice work with this mp. as i can see you’re registering mibs of cisco in the setup… can i register additional mibs by myself to extend the range of SNMP IDs/Traps scom can understand? Physical Connection Present is empty, except for the DEFAULT_VLAN Interface, where the property is 2. Alle performance counters (except the one for the CPU utilization) are empty. Maybe there is some kind of bad mismatch? We would really like to help to debug the problem and investigate further in testing. Awesome management pack! I’m testing out the Dell PowerEdge, APC and Cisco packs now. I was wondering something regarding the APC management pack. Do you know if it supports Netbotz devices? Netbotz is owned by APC and the MP that APC built does support them, but I’m not sure about the xSNMP pack. Thanks! I am really excited about using this mp, but i have not figured out how to enable the monitoring of the interfaces. It look straight forward, but in using the Override mp nothing happens and the interfaces discovered are never monitored. Can anyone assist, what am I doing wrong. I agree. they are really nice and pretty easy to implement. Just need to read the docs carefully. Check the interfaces types that are defined inside xsnmp network interfaces groups. “My Brocade management pack depends on the Brocade switch’s SNMP implementation reporting FibreChannel interfaces in the RFC-1213 ifTable. I chose not to discover interfaces in this MP from the Brocade specific SNMP tables, because newer Brocade firmware versions expose FC interfaces in the iftable, and I did not want to have duplicate interface monitoring. Brocade 3800 and 2800 will never respond to the MIB 1.3.6.1.2.1.2.2.1.2 as it was not implemented in its FOS. So to reply with the “FC ports” every switch has to be upgraded to 6.3.0, except in case of the 24000 that they will have to upgrade to 5.3.2c. First of thank you for this great mp! I have only a problem to integrade the ILOM to System Center Operations Manager 2007. In your documentation you say, that the ILOM have to use the SUN-PLATFORM-MIB and I think here is the problem. …The problem with the SUN-PLATFORM-MIB on these platforms was that it was traping out IPMI event numeric codes…. I am not sure whether there is a layer 8 error or it is not supportet to use the SNMP-agent on this ILOM. I want to know if Cisco management pack allows to surpervise all cisco devices. System.FormatException: Invalid character in a Base-64 string. how can i download the xsnmp MP for SCOM 2007 R2? I just imported xSNMP.Brocade MP to SCOM 2007 R2. Everything works fine, but I have one problem with monitoring objects, named xSNMP.Brocade.Interface. It looks like a true that the monitor xSNMP.Monitor.InterfaceStatusPoll was inheriet from xSNMP.Interface object, so it use same OIDs like Interface Objects of xSNMP.Interface (.1.3.6.1.2.1.2.2.1.1). Thereby monitoring Dashboard will always looks like a GREEN zone – that is all intefaces are ok :)), even if FCInterface OIDs – PhyState (.1.3.6.1.4.1.1588.2.1.1.1.6.2.1.3) are not. Help me please to resolve this problem. I need your help I can’t see the link where I can download this Cisco-MP “”” xSNMP Management Pack Suite Version 1.1.0 (Beta)””. I know this is an older mp, but I’ve been looking for something more detailed for my Cisco devices that will work with SCOM 2012. The comments on codeplex lead me to believe this is not yet compatible. Any plans on an upgrade? Thanks for your hard work and willingness to share the wonderful products of that work! Bump! With this MP, is root cause analysis an option with the monitoring of Cisco devices? For example, if a whole site goes down it generates one alert for the site router and supresses all other alerts from devices behind it?